Boulder County / Safety & Law / Victim & Witness Support / Restorative Justice / Restoring What? When you broke the law, you may not have thought about who would be hurt. There may be a victim, and then there’s your family, friends, even yourself. You may not have even known that you were breaking a law, but you learned that pretty quickly when the deputy contacted you. You have received a card from the deputy or detective with our contact information and this website address, and you will receive a phone call from the BCSO RJ office. It is in your hands to decide whether or not this process is right for you. You can call or email us directly to opt in or out of the restorative justice option. The phone number is 303-441-1752, or email: lvise@bouldercounty.org. If you opt out, your case will be referred back to the deputy for charges. If you opt in, the BCSO RJ program coordinator will call you to confirm your participation and to set a date for the BCSO RJ Conference. Your case will then be assigned to two volunteer facilitators who will contact you to set up a preliminary meeting. There, we’ll ask about what happened, we will explain the process in detail, ask you about your strengths and answer any questions you have. The facilitators will also meet separately with the victim and others affected by the incident. We will send a confirmation letter with the date and time of the conference. You should treat this date as if it were a court appearance. This will be the first time you’ll meet with the victim, others affected, community members and a deputy or other law enforcement personnel. Your family or other supporters will attend as well. The goal of the facilitators is to run the conference in a manner that is respectful and safe, and to help you and the other participants create a contract that you will complete. You will have a specified completion date on the contract. You will need to send all contract items to the BCSO RJ program by that date to successfully complete the contract. Please send all items to the address provided. 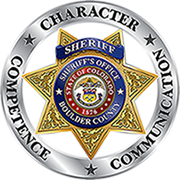 After the BCSO RJ program office receives the completed contract items, you will be sent a letter of completion, and you will have successfully completed your obligations for this incident!